This classic sofa offers a stylish yet comfortable spot to lounge in your living room. The three over three design features welted box seat cushions and a tight back. 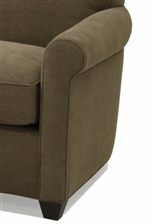 Slim rolled arms frame end ends, and sturdy contemporary block feet sit below. 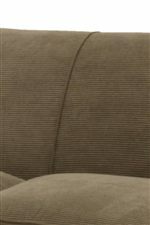 This sofa is made in America with quality materials and durable construction techniques, for long-lasting comfort and support. The 0491 Three Seat Sofa with Rolled Arms by McCreary Modern at AHFA in the area. Product availability may vary. Contact us for the most current availability on this product. Tailoring Welt cord trim for a crisp tailored look.